Shashank’s stance on cyber defense has been commended by many in the industry. He currently works for Darktrace, the world’s leading AI company for cyber defense that has over 8000 deployments worldwide. With over 29 years of progressive IT experience, Mr. Jayantra’s list of career accomplishments can overwhelm many. Some of them setting up the global captive IT Excellence Centre for Linde and setting up SAP implementation initiatives globally. Mansi is a highly qualified industry veteran with certifications in PMP, Six Sigma (black belt) and ISO 27001. Over 18 years of experience in Information security, SDLC and program management has cemented her position as an industry expert. Thorough knowledge on CMM, ISO, and pharmaceutical computing has enabled Dr Avadhutto implement more than 10 successful SAP projects in fields such as automobile, pharmaceuticals, IT strategy building, data mining and dashboarding to name a few. Mr Parna has worked in the capacity of a manager in the IT sector for over 28 years. In the last decade, he has driven digital transformation working as the CIO for automotive companies such as CNH Industrial and Honda. 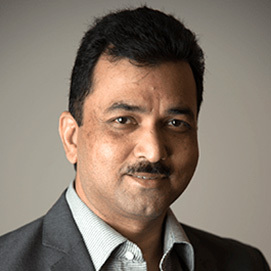 Currently working as a CTO at DCB Bank, Abhijit P Shah is a technology leader with over 23 years of successfully conceptualizing and delivering large digital transformations in the BFSI industry. Dr Sunil Gupta who has over 35 years of experience in the IT field has helped government agents implement the latest technological advancements. He has won numerous International awards and is also a renowned international speaker on IT. Makesh is an experienced Information Security professional with over 15 years of experience in industries such as baking and financial services, IT and telecommunications. He has successfully driven initiatives across Information security, risk management, and disaster recovery planning. This sustainable business transformation expert and global IT leader has helped spearhead organizational transformation in multiple industries. With over 18 years of experience in multiple industries, Mr Arindam has helped strategize result driven solutions for his clients. Pooraan has more than 20 years of experience in IT. He has worked in industries such as fashion, jewelry retail, media, finance and software solutions for companies in India, US, UK, and Australia. With over 27 years of experience in the IT, Sanjay has worked with multiple companies across the world. Mr Mahajan joined SCNL in January 2016 and has since been instrumental in deploying cost-effective IT strategies.